Halloween isn’t traditionally celebrated here in Australia, however, it has become popular in recent years. 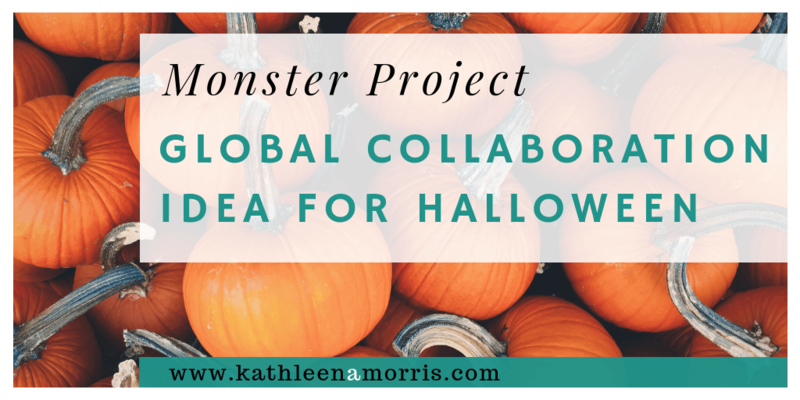 With Halloween just around the corner, I was reminded of a fun global collaborative project I organised for my students a couple of times. 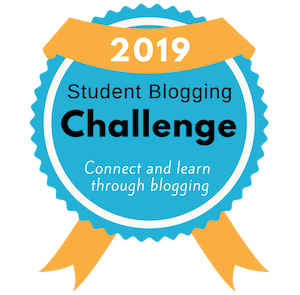 If you’re currently teaching and blogging, why not give it a shot this year? This project involves writing and art while expanding cultural understandings. Back in 2011, American teachers, Shawn Avery and Jonah Salsich, collaborated on a project called Monster Mania. My grade four students ran the same project for the next couple of years with Mr Avery’s class in Massachusetts. When I went on family leave, my team teaching partner, Kelly Jordan, also replicated the project with Linda Yollis’ class in California. Students in CLASS A are matched up with a partner in CLASS B. All students visualise a monster and draw a picture of it. Next, the students write a detailed description of their own monster. The two classes switch their writing (but don’t swap their pictures). The students have to draw their partner’s monster using the detail in the written description. The original drawing is compared to the drawing the partner made of the monster. The results of the project are always interesting and generate a lot of discussions! To demonstrate, here is the writing that my former students prepared along with their original picture and their partner’s picture attempt. It’s great for the students to be able to articulate their own learning and reflections. Writing needs to be clear and detailed for someone to generate the same mental image that you started with. Writing is an excellent way to help people create a mental image when it is done well. When you leave details out of your writing, people can’t read your mind to imagine what you were thinking. Good readers create mental images when they’re reading. Does it matter if a reader doesn’t share the exact mental image you had in mind when writing? Working together with other classes is fun! DISCUSSION: While many of the students in my class didn’t celebrate Halloween, they were curious about the tradition. We set up a post where Australian and American students could ask questions and share experiences. It generated a LOT of discussion. SKYPE: I always enjoy weaving a Skype call into collaborative projects if possible. It can bring the connection alive! Time zones can make this difficult but sometimes we’d just have the teacher call in, or enthusiastic students would come to school early or stay late! LANGUAGES: This project would be a fun way for students to communicate in a foreign language. Perhaps you could match a native speaking class with a language learning class. Or two language learning classes could pair up. TECHNOLOGY: There are many possibilities for integrating technology into this project. Instead of hand drawing their monsters, students could use an online tool to design their images. 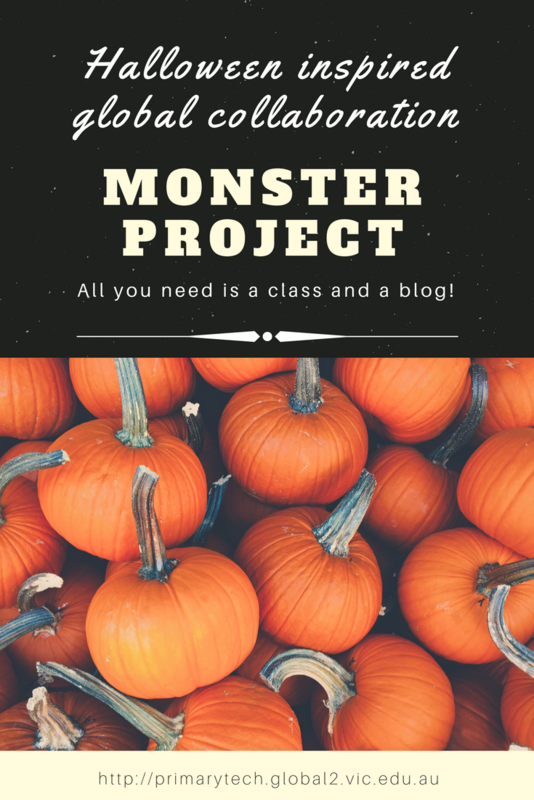 A tool like Padlet or Flipgrid could be used for students to post questions around Halloween. Students with emerging literacy skills could use a voice recording tool. Perhaps the monsters could be animations? Larry Ferlazzo lists some animation tools for students. Larry also has a collection of online art websites which may provide inspiration for this project. Does this sound like the sort of project that your students might enjoy? Why not give it a go? Don’t know any other classes to collaborate with? You don’t have to collaborate with a class overseas. It could be someone down the hall, across town or in a neighbouring state. If you want to find someone to work with, feel free to leave a comment on this post and maybe some connections can be formed. If you’re on Twitter and want help finding someone to connect with, feel free to tag me @kathleen_morris and I’ll give a shout out. This project idea doesn’t have to be done around Halloween. Maybe students could draw robots, Christmas elves, aliens, native animals or more. Adapt the idea to meet the needs of your students and your curriculum requirements. Have fun! Do you think you could adapt this project idea in your own classroom? Leave a comment and share your thoughts. Thanks! I’ll put a call out on Twitter. I’m sure we can find you someone! Any suggestions for management of the project with regarding to technology? I was thinking of having it all set up in google docs?? – Use Google Sheets or Docs to list all your students’ names and your partner can go ahead and assign one of their students to each of yours (we doubled up students to work in pairs as we had a large double class). – Write down all the info about timelines etc on a shared Doc so you’re both on the same page and know when you’ll swap writing and when you’ll publish posts etc. – We used Google Slides to make the final product. 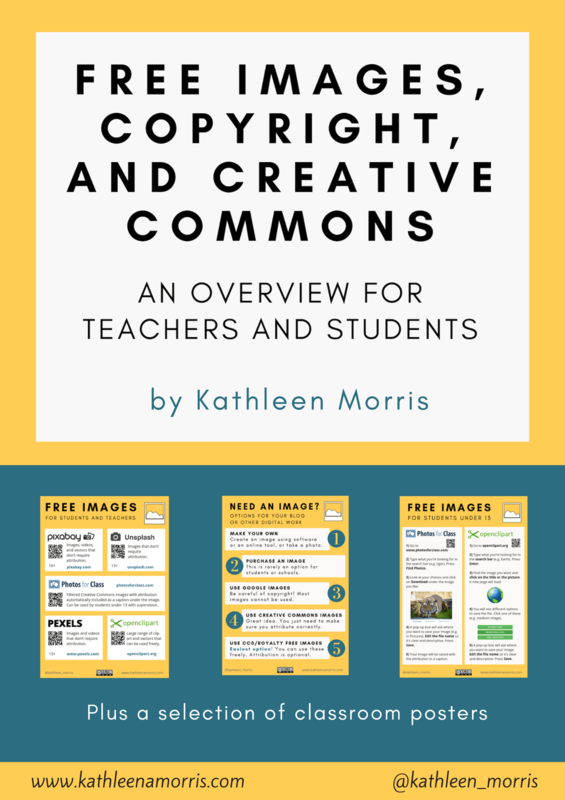 You could have a shared slideshow to exchange photos of your students’ drawings. Or, I think we might have just shared them over Google drive (just put them in a folder and share the folder with your partner). Let’s know if you have any other ideas and how you go with it! Great idea, Kathleen! It’s indeed fun for the students, and introducing skills, such as teamwork and writing, do add value to that exercise.